Select the category of a place (e.g., Banking, Lodging, Restaurant) stored in the map database to search for the destination. This option is convenient if you do not know the exact name of a place or if you want to narrow down the number of matches returned for places with a common name. You can store up to 30 favorite subcategories. Select Fav. Subcategory to access your favorites. Advanced helps you to search the subcategory. When you enter a keyword and select List, the list of appropriate subcategories is displayed. • Place Name: Searches for a place in the subcategory by name. Enter a city name when prompted. • Sort by Distance to Travel: Displays all the places in the subcategory sorted by distance from your current location. The closest place is displayed at the top. • City Vicinity: Searches for a place in the subcategory within a 20-mile radius of a specific city. Enter a city name and then a place name when prompted. Only the first approximately 1000 matching places/landmarks are displayed. • Search by Keyword: Searches for a place by keyword when you do not know the exact category. Select Sort by Distance to Travel for locations near your current location, or select City Vicinity for locations in a specific city. Enter a keyword when prompted. Select List to view a list of possible locations if one is not found automatically. For locations sorted by distance to travel, you can select More to increase the scope of the search. The number of locations increases to 100, 200, and up to approximately 1000. When the number of locations is 100 or less, you can increase the scope to 500 miles, 1000 miles, or all of U.S.
4. Select a place name from the list. 5. Set the route to your destination. The straight line distance (as the crow flies, not driving distance) and direction to the destination are shown for the highlighted place. Store up to 30 favorite subcategories. 1. Select a category on the Category screen. 2. Select Add to Fav. Subcategory. 3. Select the favorite subcategories to add. Select OK.
A subcategory stored in Fav. Subcategory has a star at the end of the line. 1. Select Delete on the Favorite Subcategory screen. 2. 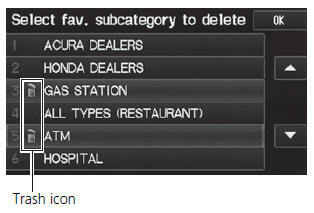 Select the subcategories to delete. ► Repeat the procedure as necessary. ► Items to be deleted are indicated with a trash icon. select a favorite subcategory (which has a star at the end of line) and select Delete from Fav.